Today, we stand at the precipice of large-scale social change in our country. Convoluted and vulgar, our political climate has been wrought with ignorance and hatred, and in the middle of it all are refugees who were forced to relocate and have experienced continuous trauma. Under the surface, lying in wait, our momentum to support is emerging to help the most vulnerable population of the world. Seattle should be, as it is has always been, the bastion of acceptance and tolerance, paving the way for other cities in the nation to follow suit. Join us to build bridges within our communities and help welcome refugees home. We will have a short presentation followed by a discussion that will identify innovative ideas to build hospitable cities. 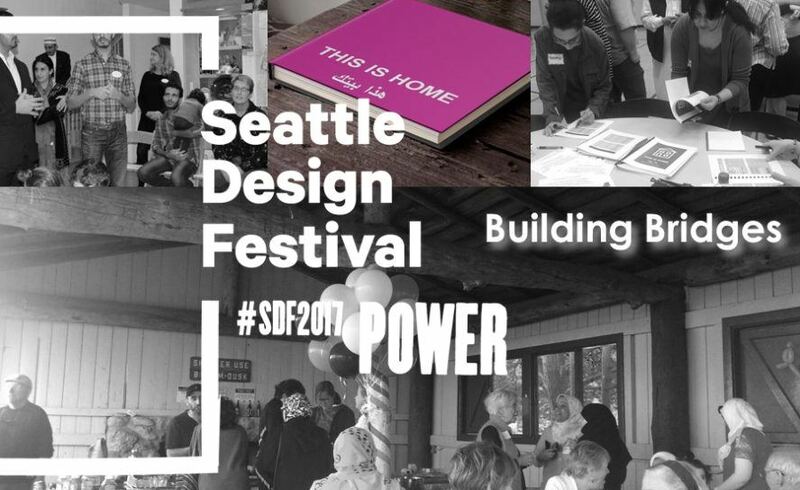 Presented by Architecture for Refuggees-USA as a part of the Seattle Design Festival. Patti Southard is the program manager for the GreenTools green building program in King County, Washington. At King County she is creative director for the award-winning EcoCool Remodel Tool and provides technical assistance for the County’s Sustainable Cities Program, LEED, Living Building Challenge, and Built Green initiatives. Patti along with Kathleen Petrie at the City of Seattle co-founded the Regional Code Collaboration, the collaboration focuses on green building and climate related codes and zoning. Southard was raised on her family farm and has focused her sustainable development career on the juxtaposition between rural and urban communities and planning. Southard has received the Built Green Pioneer Award, CGBC Public Sector Leadership Award, Inspirational Leadership Award, is a Cascadia Fellow, Living Building Hero and Honorary AIA. Rita is an Arab American business woman and community leader in the Seattle area. Rita founded the Arab-American Community Coalition of Seattle, after 9-11 works with civil rights issues, detention issues, out-reach, 24-hour Arab crisis-line for problems with discrimination and hate-crimes, and does liaison work with the Seattle Police Department, Seattle Housing Office, US Office of Civil Rights, and trains crisis-line workers for the US Department of Justice in cultural sensitivity issues. Rita participates in activities that educate the public about the Middle East and North Africa, particularly their cultures. She founded Arab Film Distribution and Salaam Cultural Museum. She frequently lectures to schools, organizations, business and travel groups. She also founded the Salaam Cultural Museum – Medical Mission to assist refugees in Iraqi, Lebanon, Syria and Jordan. Rita is a board member at – NELC- Near East Language and Culture – University of Washington. Rita received several awards for her humanitarian work such as, the United Nations Peace Award, University of Washington Farhat Ziadeh Leadership Award – Feb 2007, United States Chiefs of Police Appreciation Award, and the Women of Color Empowered Honoree – Feb 2016. Rania is an Arab American architect, she holds bachelor’s degree in architecture, and masters with honors in sustainable design. She is a board member of Architecture for Refugees, and recently established the (US) chapter, with a mission to seek better architectural solutions to increase the quality of life for refugees globally and locally. Qawasma believes that every human has the right to live in a healthy, safe, and sustainable environment. Everyone deserve a place to call home Her vision and work as an architect to empower and encourage passive architects to join the larger movement and engage in offering solutions for the displacement crisis. In addition to being an active member in the Arab American community in Seattle, Rania is a strong advocate for refugees, working with local organizations and Syrian and Iraqi refugees’ resettlement in the US. She founded This is Home project, an organization that helps refugees quickly acclimate into their new homes and communities.